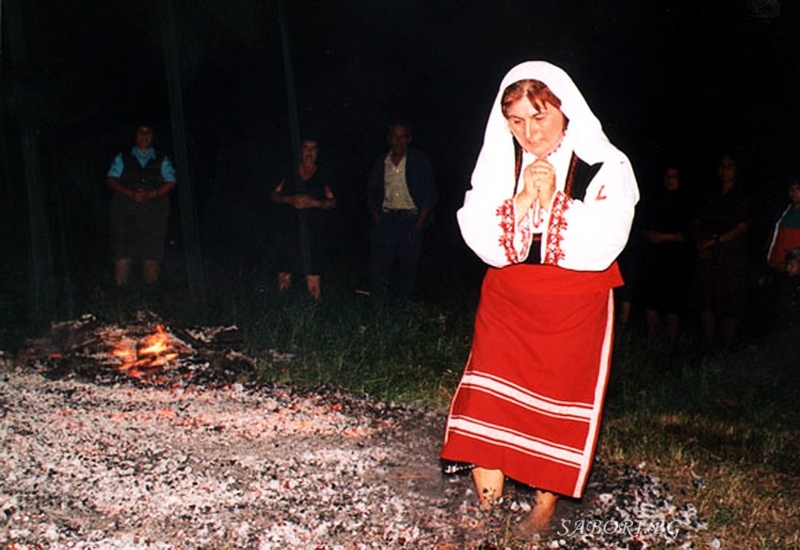 Nestinarstvo (Bulgarian: нестинарство) is a fire ritual originally performed in several Bulgarian - and Greek - speaking villages in the Strandzha Mountains close to the Black Sea coast in the very southeast of Bulgaria. 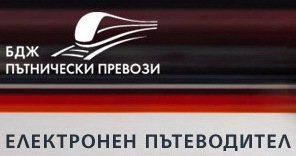 It involves a barefoot dance on smouldering embers (жарава, zharava) performed by nestinari (нестинари). 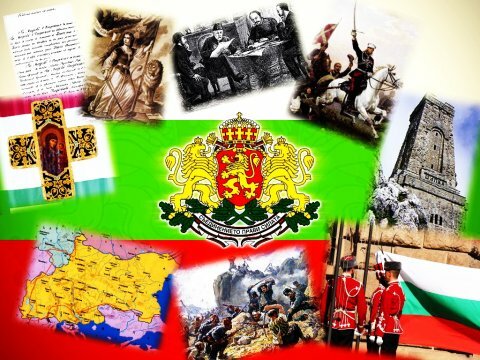 It is usually performed on the square of the village in front of the whole population on the day of ‘’Sts. 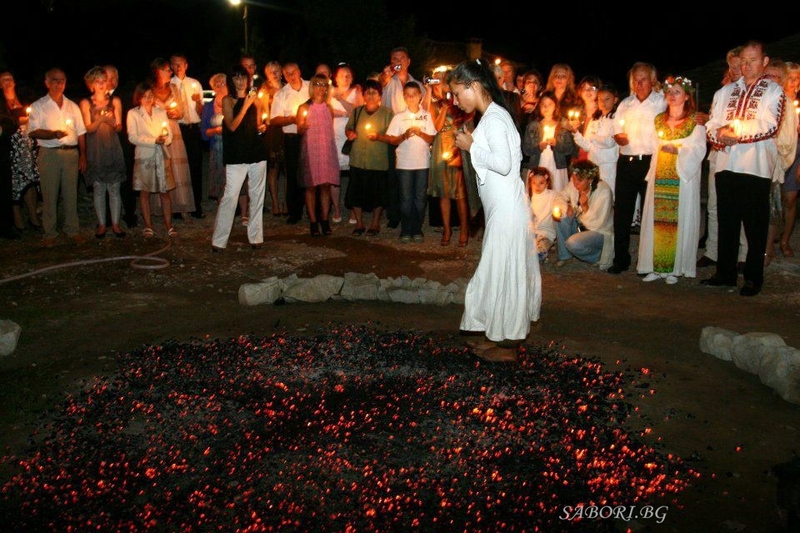 Constantine and Helen’’ or the day of the village's patron saint. 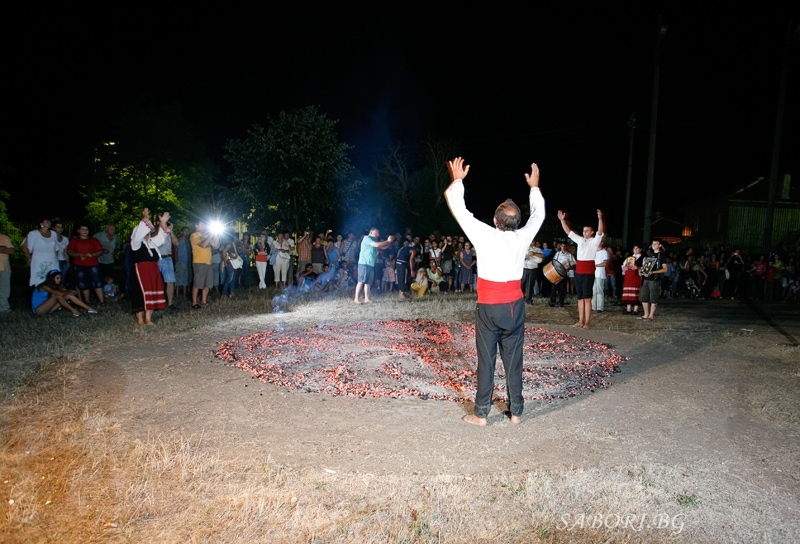 The ritual is a unique mixture of Eastern Orthodox beliefs and older pagan traditions from the Strandzha Mountains. 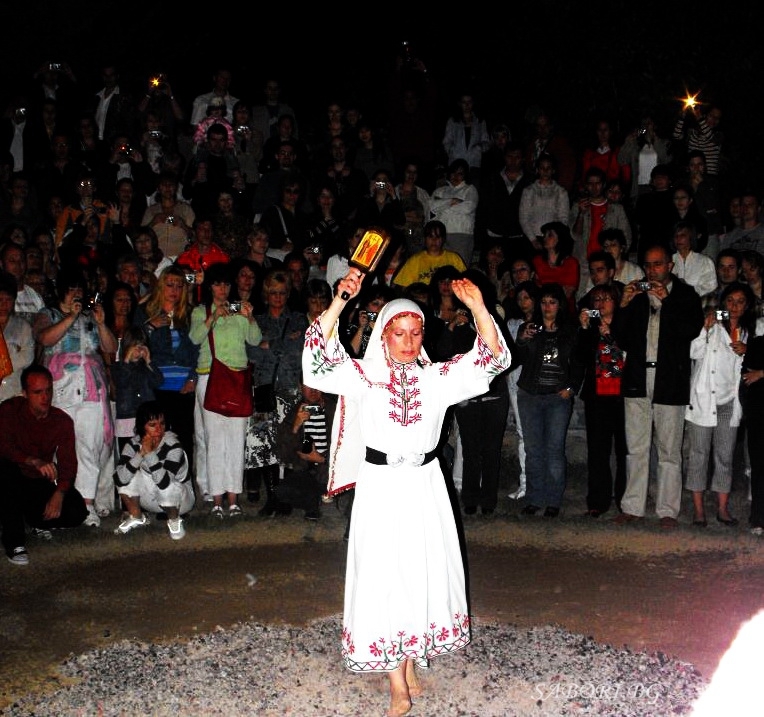 The rite of fire dancing is one of the oldest Bulgarian folk traditions and was once practiced by ancient Thracians living near The White Sea. 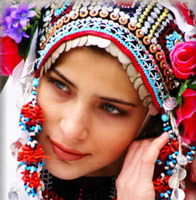 It is performed today in only a few mountain villages in the Strandzha region, such as Bulgari, Kosti, and Brodilovo. 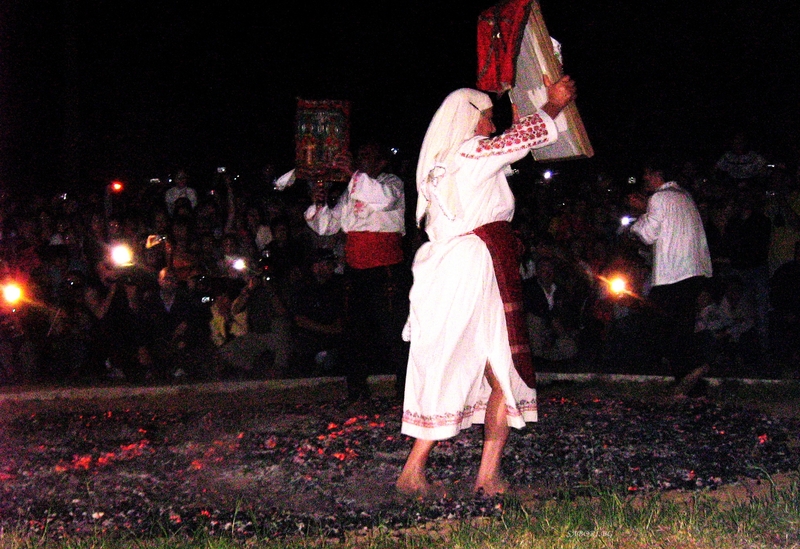 In 2009, the ritual was included as a UNESCO World Heritage legacy of non-material culture. 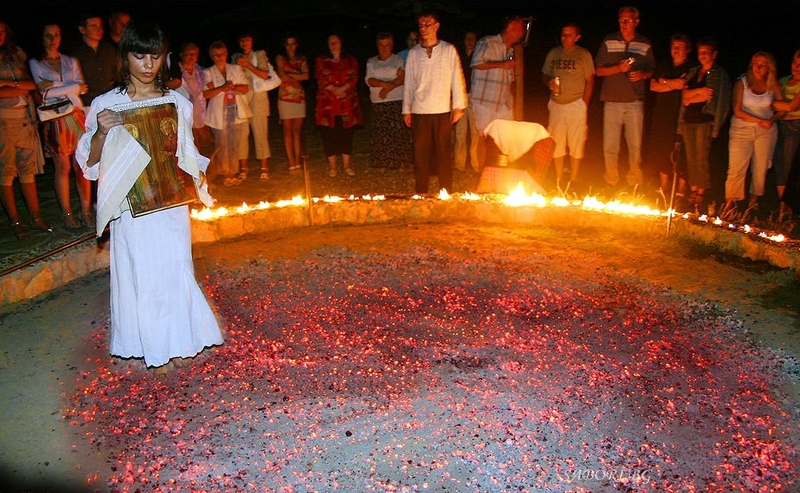 According to a number of scholars, the ritual was performed by a Thracian cult that worshipped the sun. 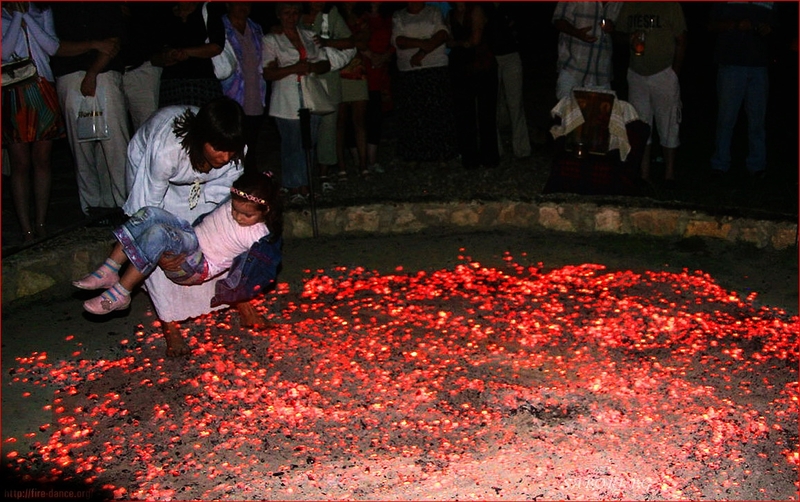 During the day of June 3, the icons that are sacred to the fire dancers are “clothed” – a bright red cloth is placed over them that has old silver coins sewn on it and is colorfully decorated. The whole village then takes part in a procession to transport the icons to the holy spring of Saint Constantine, there the handles used to carry the icons are washed. The preparation of the fire for the dance starts before noon. The fire must be laid in a symmetrical circle, so that those in attendance can all observe the rite. 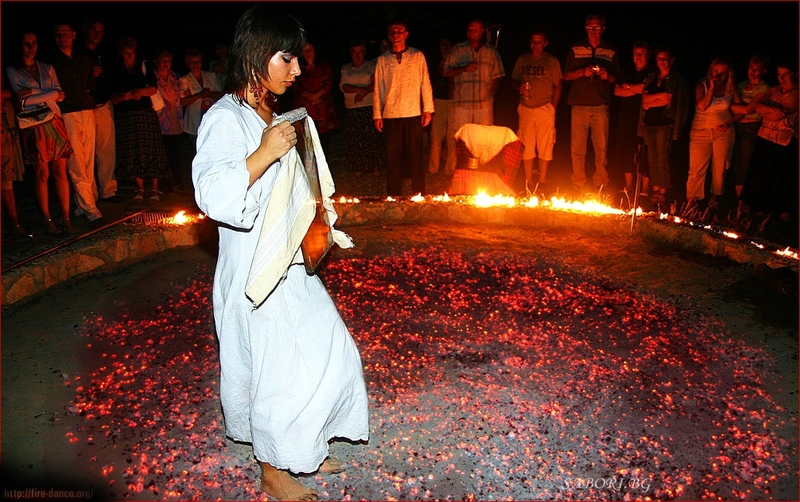 Before evening, the fire dancers and a representative of the church go to a chapel that is dedicated to Saints Constantine and Elena, where they breathe deeply of the incense and pray before the icons. Later, after it gets dark, the whole village gathers at the chapel, including musicians – a gayda (Bulgarian goatskin bagpipe) player and a drummer. 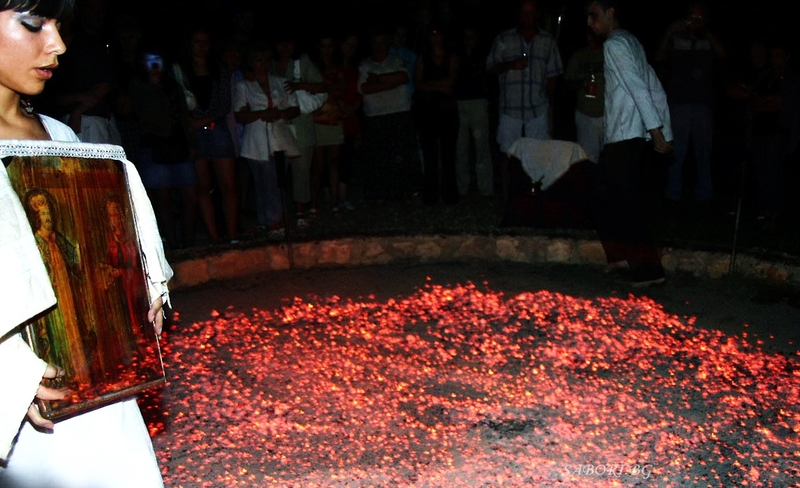 The musicians play three special melodies – the first as the celebrants make their way from the chapel to the fire, the second when the dancers approach the coals, and the third to accompany the Kostadin Horo (a group dance). Then there is a second ritual procession circling the fire, and the culmination of the ceremony begins. 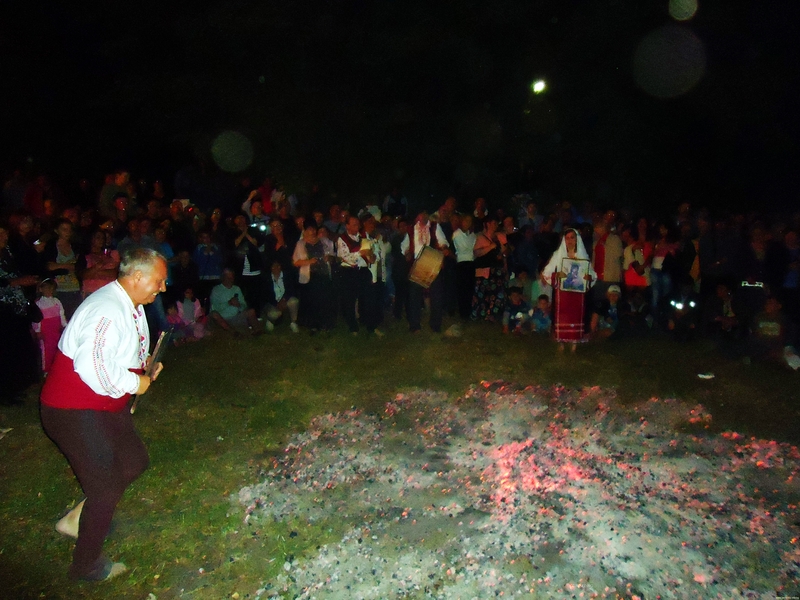 With swan-like movements the first of the Nestinari walks over the fire. He carries the icon of Saint Konstantin and is rapidly followed by a woman carrying the icon of Saint Elena. Everybody shouts and claps their hands. Then a third Nestinari goes accros. At a very relaxed pace this time and actually lingering and going back and forth somewhere near the middle. This goes on for maybe ten minutes. 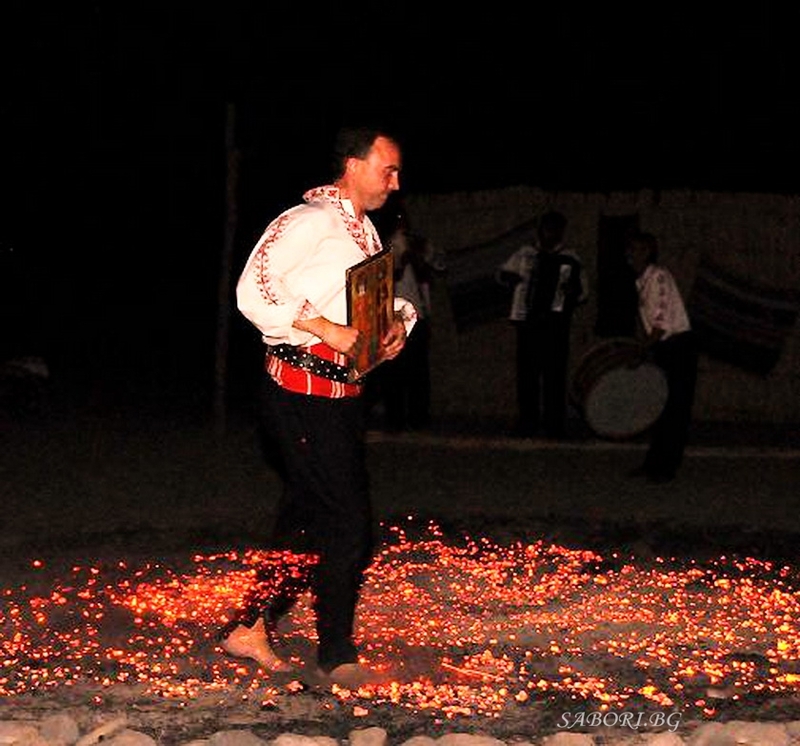 Every time before the Nestinari cross the fire they pause their rhythmic movements for a few heartbeats. 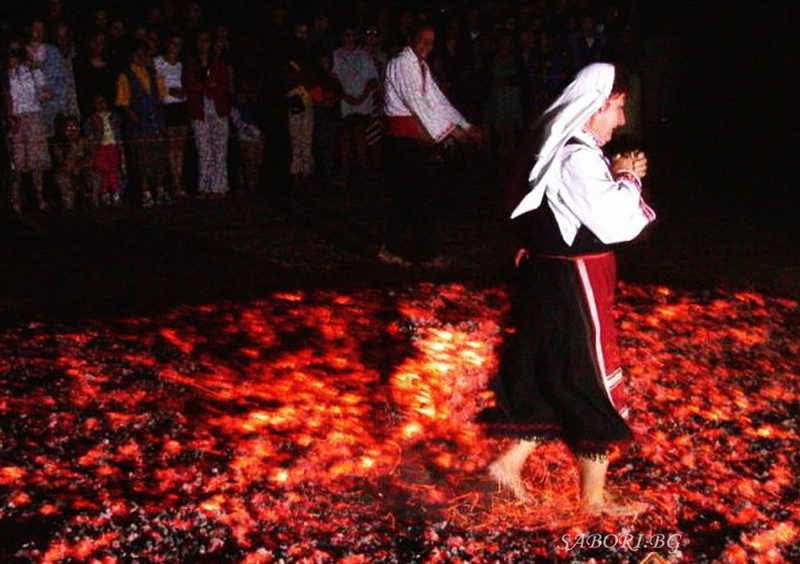 They seem to gather some sort of mystic energy that allows them to walk on the burning coals unharmed.